Sometimes being an introvert is a pain. During May and June (as I have many, many times before) I crawled into myself and stayed there. I was a functioning introvert. I still went to work and small group and church and a few social things. I still taught a class on Galatians, lead a book club discussion, lead a 9-week study in my small group, counseled several hurting people and even did a few social things here and there. I was upright and talking (maybe with my eyes glazed over a bit) with a coffee cup in my hand and an ache in my heart. But – I remained inside of myself. This is my absolutely favorite children's bible. 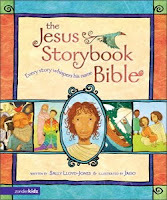 I hadn't read any sort of children's bible since I was a child myself and when I was looking for something different to use in Children’s Church, I knew The Jesus Storybook Bible would be the way to go. It was highly endorsed at seminary, and several friends of mine use it in Children's Ministry at their church. Sally Lloyd-Jones tells the story of God rescuing us over and over throughout this bible in a beautiful and thoughtful way. I spent most of the morning on my back patio, watching the rain fall down over the dry desert land, talking on the phone with my loved ones far away and re-reading Blue Like Jazz. It's 75 degrees outside right now. And it's July. In ARIZONA. Never, ever happens. Monsoon season is strange to this Midwestern girl. I'm used to storms, most certainly, but these are very different. There is usually a great deal of lightening and very little thunder. Most of the time it’s just small and big haboobs, caused my lungs to fill with dust and sneezes for days after. Never have I experienced a monsoon day that is cool like this one. I know this is God’s gracious care for me filling my heart. My heart that was desperate for a filling up. The air smelled like I was back in Nebraska this morning and nothing has ever felt so sweet.